As a homeschool mom, I am always on the prowl for interactive educational games and resources to help make learning fun for my kids. As much as possible we try to bring in play as a method of teaching to help the kids truly process what they are learning and experiment with it further (all without boring them to tears). I first heard about the Osmo™ system last year on TV and it was a, “Pause the PVR,” moment in this house. The kids instantly began asking if they could have the game, and I found myself tuning them out as I hit rewind on the PVR, wanting to see this incredible hands-on learning resource in action once again. From that day on, Osmo was a known name in our house: like a long lost family member we hadn’t met but felt akin to. 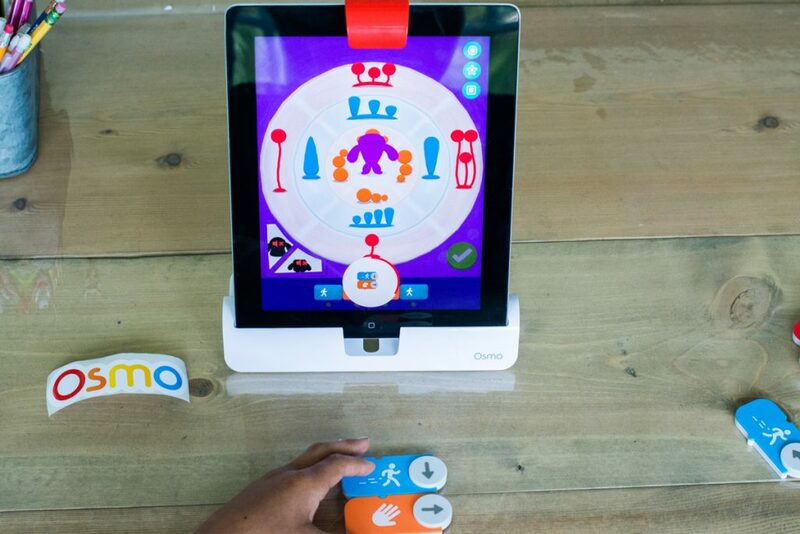 Life got busy, money got tight, and slowly but surely Osmo was pushed onto the backburner of someday. That’s why when I was contacted by the team over at Tangible Play™ about reviewing this system for you guys, I was ALL over it! My kids’ enthusiasm was contagious and we all waited with baited breath for the long-anticipated package to arrive in the mail. A few weeks ago our box arrived and the kids pulled out scissors and sharp pencils and even their sorely neglected long fingernails to pierce the tape, despite my solid attempts to get them to wait for me to help them. Today I am going to talk to you about the different games we received, a brief description of how they work, as well as how I see this fitting into our homeschool in the coming months. Osmo sent us a couple of free Wonder kits to try with the kids. The Wonder Kits include most of the games they have right now including Masterpiece, Newton, Words, Tanagram, Numbers, and Coding Awbie. The kit retails at $145 and is only available on the website here, though other sets and packages are available on Amazon, you can check out my affiliate links both on Amazon.com and Amazon.ca. The Osmo is recommended for kids ages 5-12 (though the Monster game which I do not have to show you can work for children a bit younger) and each game comes with a free app to use on your iPad (please note, the Osmo is only compatible with Apple right now, and you will need an iPad without its cover to play the game). The games are all educational and fun and you can add multiple players and profiles to use them with all your kids! 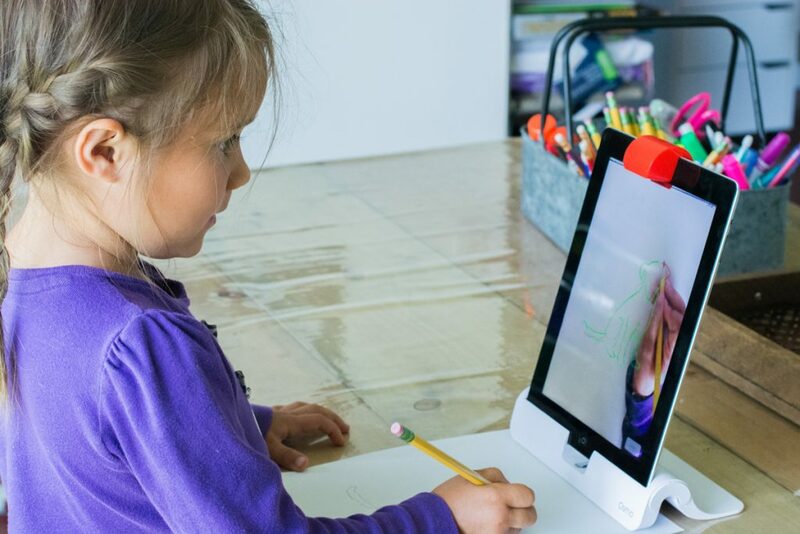 The Osmo base is just $19 and works with both older versions of iPads with the handy adapters they include as well as iPad mini’s and newer versions. It is a necessary component to any game you have. Because the apps are all free downloads, by simply purchasing the base you have access to Masterpiece and Newton, two of the games you don’t need additional components for. The base also come with a little red camera deflector. It is plastic and has a mirror inside which essentially redirects your camera to point downwards so that it can see what you are doing. It is a great way to get started for relatively cheap and you can add the games down the road as gifts or incentives or as the budget allows. We’ve only had the kit for a few weeks and my kids have naturally fallen in love with 3 of the games over any other: Masterpiece, Coding Awbie, and Coding Jam so I am going to focus on those three games so that I don’t take up your entire day gushing about this program! Masterpiece is probably one of my favorites as well. 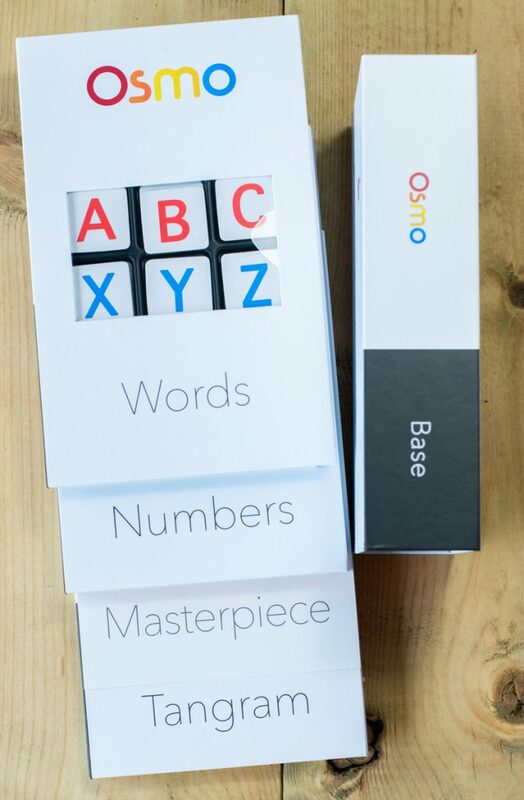 All you need for this game is the Osmo base, the free app, a pen or pencil and a piece of white paper. There are a number of different ways to use this program. The game has a ton of line art, doodles, and simple sketches loaded in the app that you can use to learn with. My newly minted 5-year-old was the first to try, despite the fact that both her and I thought it might be too hard for her, we were both proven wrong. The camera shows you your hand as you draw and the idea is to watch the screen rather than looking at your hand. After trying it myself (much harder than it looks) I could tell it was building muscle memory and helping to teach the techniques without getting caught up in what it looks like in the process. You simply follow the lines and can see yourself do so as you sketch. The second way to use this is to take a picture of ANYTHING or ANYONE and convert it to lines within the app. You simply take the pic on your iPad, open the app to find the image and convert it to lines. You can adjust the detail in the line art, it helps to start off with just the basic lines and add detail as you go. This is great for more advanced artists or even adults! I can think of endless uses for this app, even for myself! I recently saw a post where an adult was using it to do watercolor painting! The absolute COOLEST thing about this app, however, is that it records your entire drawing time! 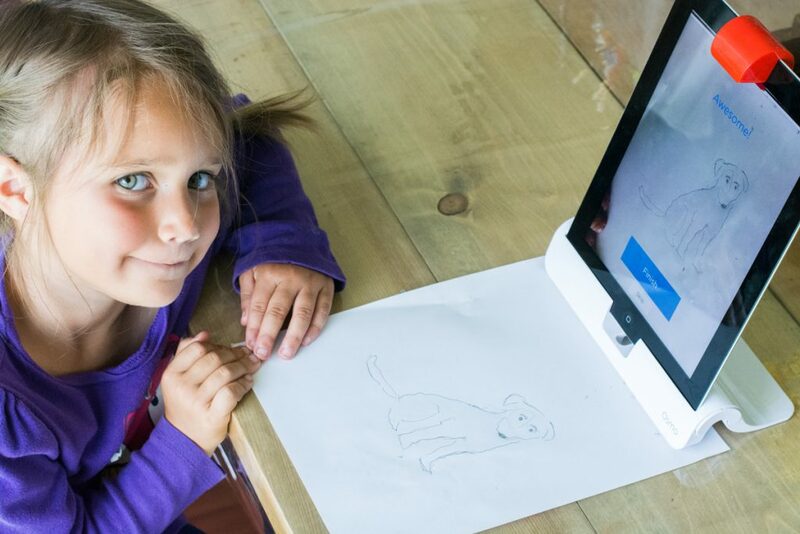 When your drawing is complete it creates a time lapse of your drawing that you can save to your iPad or share with the Osmo community! Again, I am tempted to use this for my planning spreads to show how I do them or to teach people how to brush letter. It is so fun to watch the process with the kids and it is really our favorite part of drawing, watching it replayed like that makes it look so easy! The games that I most commonly hear my kids playing, however, is one of the coding games, either Coding Awbie or Coding Jam. Coding Awbie is the first coding game by Tangible Play. The best way to describe it is that the game itself is kind of like a fun Pac Man, where you help Awbie eat berries and follow the trail. However, your kids have to create commands using magnetic tiles to make Awbie move! Imagine with me, a way to teach your kids the basics of coding as well as strategy and problem-solving skills, without them even knowing they were learning a thing! This game is FUN, so fun in fact that I had to sneak it out one night when the kids were in bed and try it myself (true story)! The coding blocks click together with the magnets in them, are high quality and durable and yet simple, my kids required no training from me or instructions to play the game. Learn more about the blocks HERE. Each command is done on one line, similar to the line-by-line approach in computer coding. Once you have completed your “code” you attach the green play button and hit play while you watch Awbie follow your instructions. My 5-year-old can play this independently and it is a huge hit with all the kids. 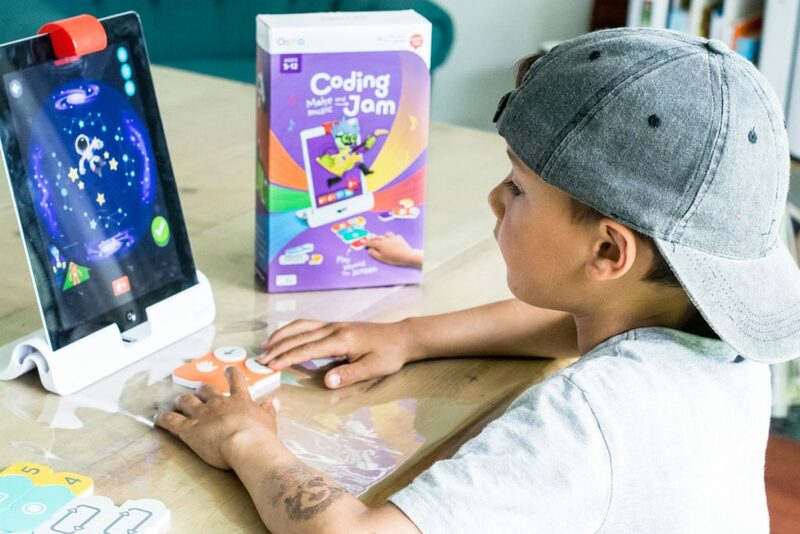 Coding Jam is the newest release by Tangible Play. You need the base in order to play this game, as well as the free app and the tiles. I love how you can extend your play by using the tiles from Coding Awbie to create larger codes for older children. In this game, children create code the same way as Coding Awbie, but instead of moving their character to complete a maze, they are creating a song. They learn rhythm, learn about different notes and combinations, and create harmonies and melodies. After they have finished their song, they can share it with family or friends as well as the Osmo community. This is a fantastic addition to any home that wants to start with the basics of music in a fun, no-pressure way. As a homeschool mom, I can see so many uses for this system! I have been doing research and learned I can make custom albums for the words game, adding any words we are working on. I am considering using Osmo Words for a hands-on spelling program! The Masterpeice game will be used by both myself and the kids to help teach them art skills, build muscle memory, or as a teaching tool to create a time lapse showing them a specific skill. Coding Jam and Coding Awbie are going to be a regular part of our homeschool day, probably used both as a reward for doing their “school” while I check it off in our planner as “coding class”. The kids won’t even know they are doing another subject and it will help keep one occupied while I work one-on-one with another child. I haven’t even explored all the other games but we are excited to try them out and see how we can implement them in our homeschool as math resources, LA resources, and more! I personally think this interactive educational game is amazing for kinesthetic learners, children with developmental delays, dyslexia and dysgraphia, and other learning challenges. 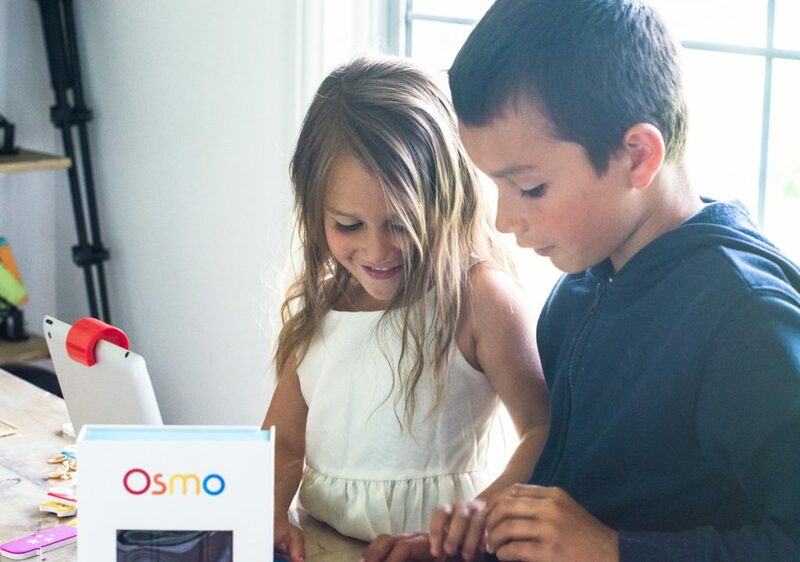 We are so excited to bring in Osmo time to our homeschool day and give the kids an opportunity to learn various skills in a fun, hands-on way. Check out the FAQ for more info or comment below if you have any questions I didn’t address in this (very) long gush post. 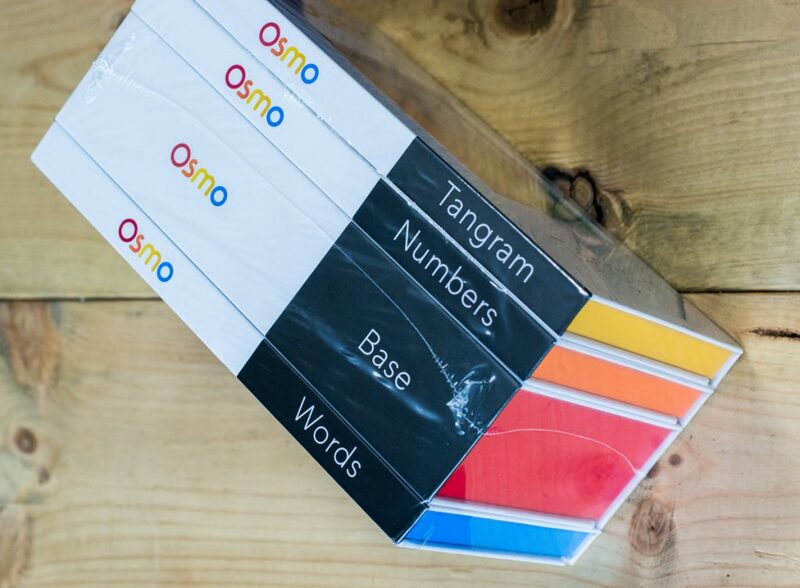 Obviously, we love the Osmo and I think you will too! Hi Rebecca! Thanks for the detailed review. I am wondering if this is too rudimentary for a newly minted 13 yr old, working at about a gr 5/6 level? I am mostly interested in the coding and drawing games. Ohh wow! Lovely post. i am so happy that i visited your blog. This is an interesting blog. I loved your “Interactive Educational Games for Kids” post. This will definitely be helpful for the kids. Thank you so much for sharing!